Infragravity waves are ocean surface gravity waves generated by ocean waves of shorter periods. The amplitude of infragravity waves is most important in shallow water, in particular along coastlines hit by high amplitude and long period wind waves and ocean swells. Wind waves and ocean swells are shorter, with typical dominant periods of 1 to 25 s. In contrast, the dominant period of infragravity waves is typically 80 to 300 s, which is close to the typical periods of tsunamis, with which they share similar propagation properties including very fast celerities in deep water. As a result, infragravity waves differ from normal oceanic gravity waves, which are created by wind acting on the surface of the sea, and are slower than the generating wind. 1 2 Bromirski, Peter D.; Olga V. Sergienko; Douglas R. MacAyeal (2010). 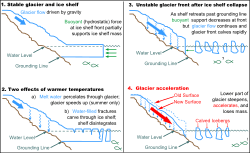 "Transoceanic infragravity waves impacting Antarctic ice shelves". Geophysical Research Letters. American Geophysical Union. 37 (L02502). Bibcode:2010GeoRL..3702502B. doi:10.1029/2009GL041488. ↑ Kinsman, Blair (1965). 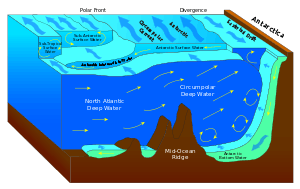 Wind Waves: Their Generation and Propagation on the Ocean Surface. Englewood Cliffs, N.J.: Prentice-Hall. pp. 22–23. OCLC 489729. ↑ Lugo-Fernández, A.; H. H. Roberts; W. J. Wiseman Jr.; B. L. Carter (December 1998). "Water level and currents of tidal and infragravity periods at Tague Reef, St. Croix (USVI)". Coral Reefs. 17 (4): 343–349. doi:10.1007/s003380050137. ↑ Péquignet, A. C.; J. M. Becker; M. A. Merrifield; J. Aucan (2009). "Forcing of resonant modes on a fringing reef during tropical storm Man-Yi". Geophys. Res. Lett. 36 (L03607). Bibcode:2009GeoRL..3603607P. doi:10.1029/2008GL036259. ↑ "Breaking waves: The coup de grace that shatters ice shelves is administered by ocean waves". The Economist. February 18, 2010. Retrieved 2010-11-25.